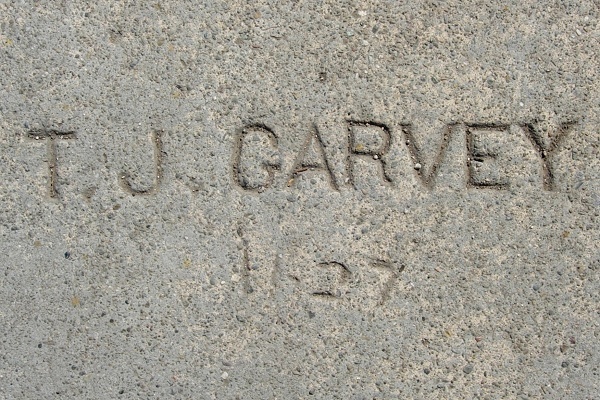 Thomas Joseph Garvey was born in Fresno in 1898; his father John J. Garvey was a Kansan of Irish descent and his mother Elizabeth was a Northern Irish native. By 1910 his family was living in Oakland, and he grew up at various addresses along Adeline Street. His 1918 draft registration form described him as a tall man of medium build, with blue eyes and brown hair. 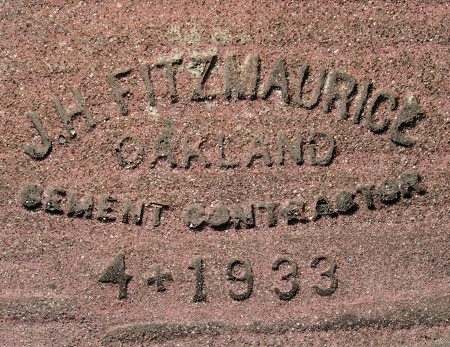 He followed his father briefly into shipfitting, but in 1927 he was in business as a concrete contractor, living with his wife Fern (born in 1900) at 716 8th Street. 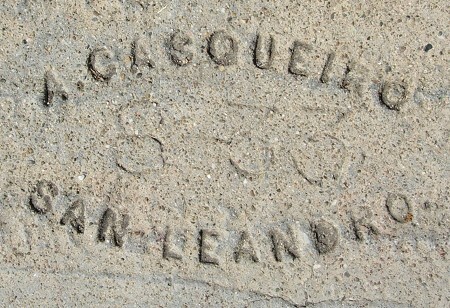 As of 1930 the couple had moved up to 5686 Ocean View Drive, and from 1937 on they lived at 4520 Harbord Drive. T. J. Garvey’s marks fall rather neatly into three periods. This was his first stamp. 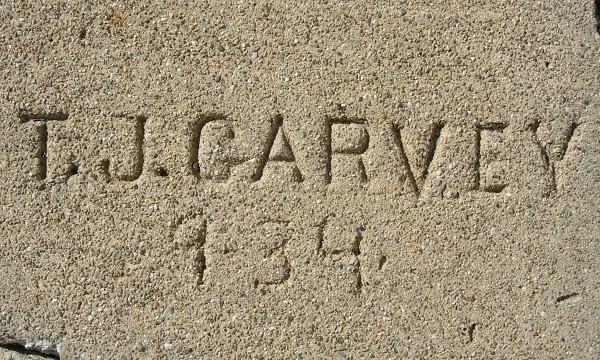 The mark below, at 941 Arlington Street, is one I documented just a few days ago, the first example from 1933. By the next year, his stamp had begun to degrade, and he was touching it up by hand. Most of his marks from then through the war years were partly or fully hand-drawn. Then in 1947 he got a new stamp that used a serifed font, like Courier. He used this one consistently through the 1950s. 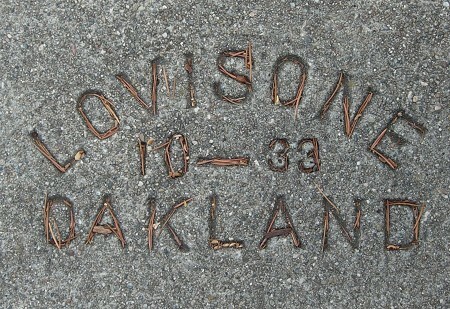 The latest mark I have is this one from 1958, on Tunnel Road. 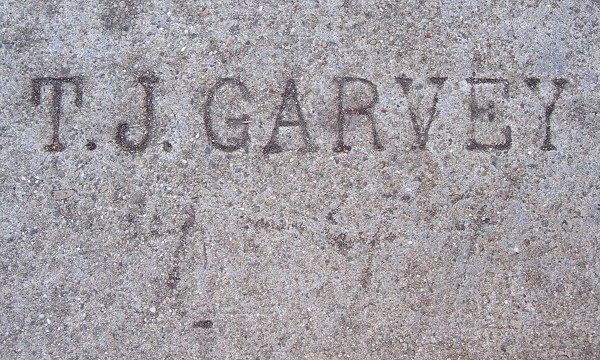 Garvey died in 1960, and his wife lived on in the Harbord Drive home at least through the 1960s. She died in 1987, and both are buried in Holy Sepulcher Cemetery in Hayward. 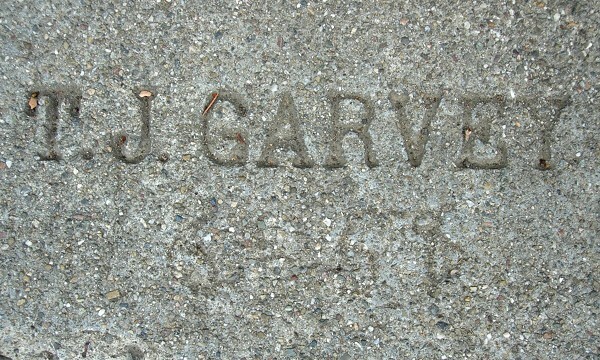 Marks from T. J. Garvey’s 32-year career are scattered widely throughout Oakland, though only a small fraction of them bear dates. You can at least assign them a decade just by looking at them. I’m only missing examples from 1929, 1932, 1942, 1943, 1945, 1951 and 1957. Perhaps they survive in neighboring cities. This is a far better strike of the Lovisone mark than the previous one I documented. I can safely say it’s the best in Oakland. 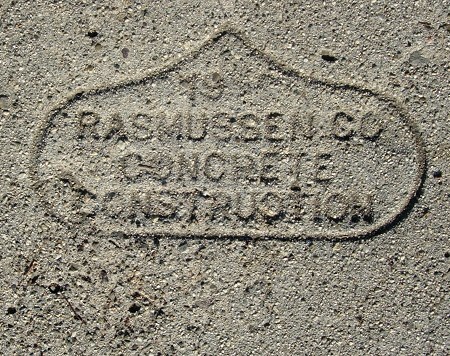 Unlike my other version of Rasmussen’s mark from 1933, this one leaves the stub date at the top truncated. 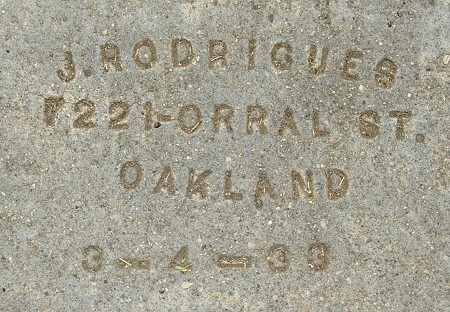 This is a good time to mention that I will be giving a talk to the Oakland Heritage Alliance about Oakland’s sidewalk stamps on Thursday, January 15, at 7 pm up at Chapel of the Chimes. Watch for details over there. 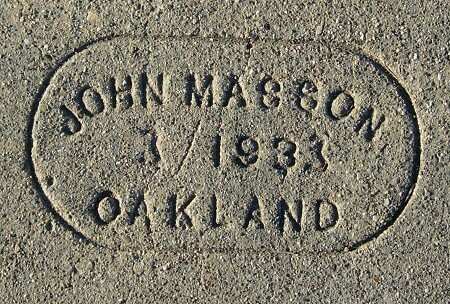 This is only the second mark I’ve found by John Masson; will probably be the best one I ever find. This is satisfying, because I’ve recorded several other Fitzmaurice marks from this year, but the date has always been handwritten. 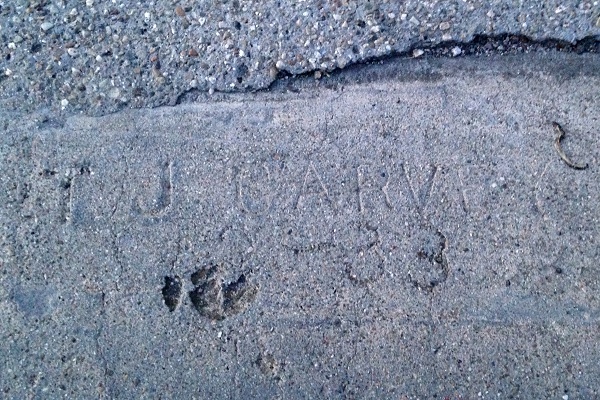 Here’s a beautifully stamped date, AND in the rich red concrete of the Havenscourt neighborhood.